Hi everyone, I'm interested in purchasing a boat cover for the first time. I'm wondering if anyone can give me any suggestions for a cover brand. I came across a site that offers Carver and Taylor - http://savvyboater.com/c-43-boat-covers.aspx but I don't know if those are quality or not. Please let me know what you all think. Thanks. If it is kept in the weather there have been threads about this. You may try a search. Basically a 2x4 ridge supported where needed and use a waterproof tarp pulled taught like an A frame roof. Sheds water without moisture build up underneath on warmer sunny days. Your boat type and location may help. Is the cover for rain, snow, dust, sun? $100 tarp and some pvc pipe. wont hold snow. Here is my poor baby, I mean my cover, talked to my local canvas guy and had one made, also had console and seat covers made...nice package deal. If it's for extended storage, weight and size don't matter all that much. If it's for on/off/on/off use, then having a large cover can be a burden; especially if it's windy. 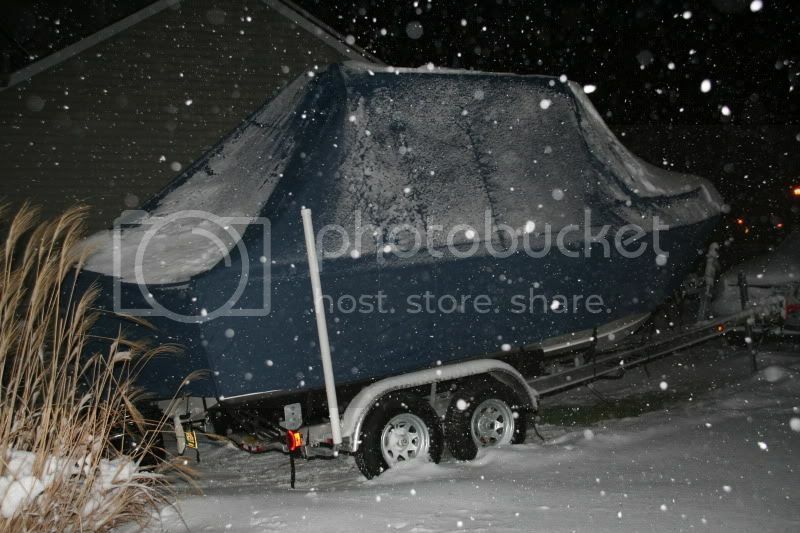 Like 240STS said, the type and size of boat you have goes a long way to determining what cover might work best. If it's for offseason storage I had a Fisher Canvas cover made for my Albemarle. They are heavy but do the job. Put it on at the end of the seaso0n and off in the spring. For a cver for during the season, I have a Carver semi custom cover for my Maycraft 1900. The cover was made for my boat and fits very well. I also have a Carver T-top that I like very much.. Location: Boat,Town Cove, Cape Cod. Live south of Boston. If you decide on a ready made cover, go with the heaviest weight material you can find, that's what I did with my first cover and it lasted about 7 years before it had to be replaced. My second cover was one of those light weight "Sharkskin" covers advertised to be tough and durable, didn't last 2 years before it ripped up and needed to be replaced. I bought this cover at Boatcoversdirect. It's on its second season,and holding up exceptionally well. I didn't think there was any way it would survive this weekends storm, but it did. I paid about $600 for it and it's been worth every penny. 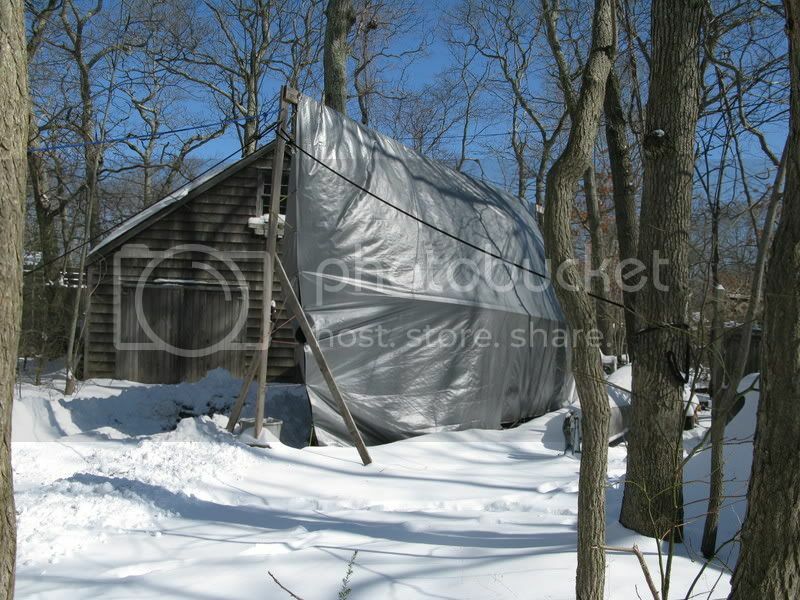 It has withstood some hellacious winds too, especially from this blizzard over the weekend. Bought a Fisher cover also, NO regrets, fit perfect. I have had it for about five years now with no signs of needing to be replaced. Send a private message to Phil K.
Find More Posts by Phil K.